Open access proves to be an extremely controversial topic on many discussion and social media platforms. The idea of openness can be interpreted in various different ways. I was interested to find out my peers’ opinions on this particular topic and more importantly compare them with my own views surrounding open access and the whole idea of knowledge being openly shared. I wasn’t particularly surprised to see that my attitude towards openness was similar to my classmates’. 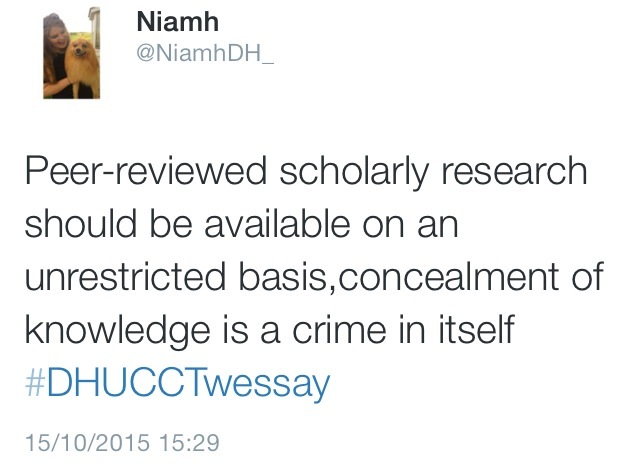 The general consensus was that knowledge should not be available on a restricted basis, or only available to those willing to pay. It shouldn’t be concealed. It was interesting to see people’s different ways of viewing openness, some visualising it as a tangible concept, like a “box” of knowledge, others considering it more as an intangible concept, it is merely information floating around. It is not until I have come to college that I have started to properly appreciate the importance of other people’s research, how it can be retrieved and how much it costs to get your hands on it. While researching for my assignment for my minor Arts subject I have come across obstacles regarding open access, I have come across a handful of academic articles that meet the specifications of my essay title, but are only available to me (a student who is contributing to this country) for a small fee of 180 euro. I will probably never get my hands on these particular articles, I’m not that upset. However for someone in the medical or scientific field, an article that proves challenging to access could make or break a potential medical advance or scientific discovery. From observing the various “twessays” surrounding openness, the general consensus is that putting a restriction on peer reviewed academic articles or research, inhibits one’s ability to acquire knowledge. Not only could open access benefit those looking for information but it could also benefit university libraries economically, by not having to purchase subscriptions to as many academic journals. The prices of journals have been described as unsustainable and untenable (Suber,2012).Journal prices are inflating and the average academic library budget cannot handle the financial demands of such journals .Can library budgets meet the increasing cost of journal subscriptions without some form of open access being introduced?(Worlock,2004). There is also the debate that open access journals (as opposed to costly subscription journals) would undermine important values such as editorial quality (Van Noorden, 2013).The question also arises whether expensive, reputable journals can survive in an open access world. Students are not just seeking out open access research, but research that has been peer-reviewed, this proves to be of huge importance in the science and medical fields. I feel like the most important thing in regards to open access is not just to have a huge quantity of information accessible, but also to have quality information that can be accessed on an unrestricted basis. In regards to the “twessays” and their content, the topic surrounding the quality of open access such as editing and reviewing was not explored. Open access has its limitations, however the proposed benefits of open access outweigh these limitations. I felt like the benefits surrounding openness were only explored and the limitations were not touched on. You have problems regarding sustainability, quality control and publication fees. However the various benefits of open access which were explored in the “twessays” included the idea of knowledge for all, increased readership and more possibilities for those in third world countries. I was not surprised to find that my viewpoint in regards to openness was similar to my classmates’ opinions. 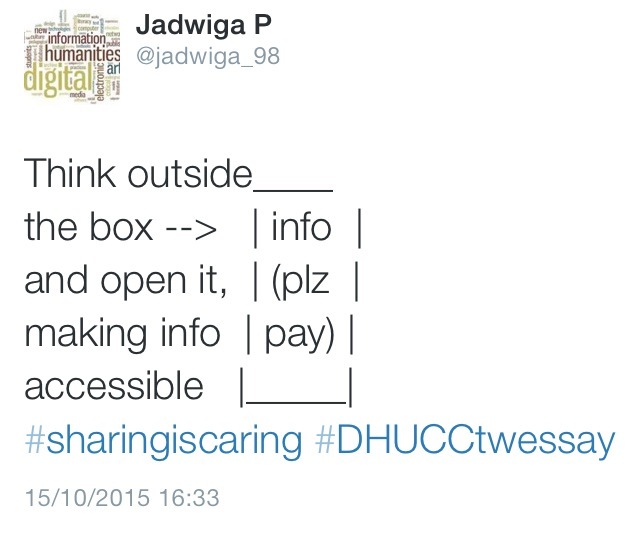 I really enjoyed @jadwiga_98’s idea of openness being a box,and the information inside to be shared on an unrestricted basis. I also enjoyed @deebrady_dh’s focus on inspiring creativity through open access.